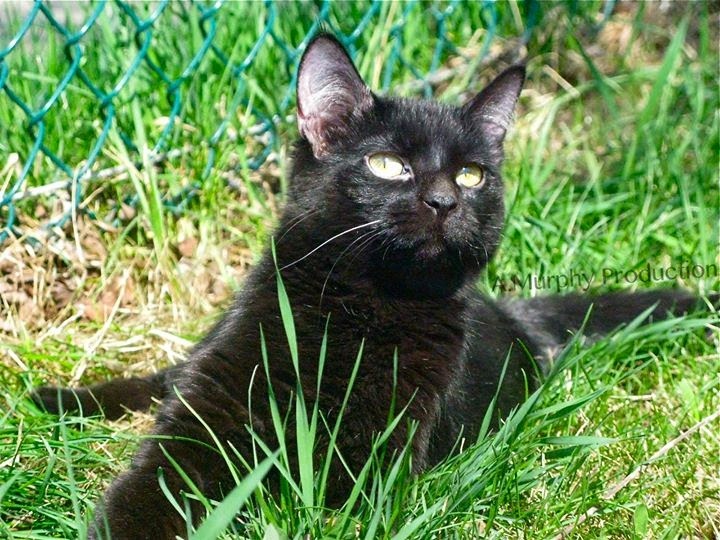 Today, I bring you an interview from a very special kitten named Merida. She is 9 months old and lives in Edmonton, Alberta with her mommy. Merida has an unknown neurological condition that causes her to wobble and be unstable when she walks. It was recommended by a veterinarian that Merida be euthanized but her mom is stubborn and said no! Merida's mom, Amber, gives her lots of extra special care everyday and is dedicated to finding answers about her health condition. "I was born with what seemed to be a dislocated arm. When everyone else started walking, I fell off a deck and onto the pavement where I was left crying. Mama kissed me better, but I kept falling alot on the pavement and such. I was stuck without shelter for 3 severe thunderstorms with hail, and a massive week long heat wave. Mama looked after me best she could but didn't have the extra time I needed. So I was dying when my new mommy scooped me up and saved me." I am so pleased to have had the opportunity to interview Merida and her mom and get to know them both a little better! What kind of special things do you have to do to help Merida through everyday life? She needs help being steady while eating. She is too unstable to drink, so she does not drink. I hold her and she walks around the house everyday for a total of 20-40 minutes a day. I assist her in climbing as a form of physio therapy. I help her warm up her back leg muscles so she can get around better. I cuddle her and calm her when she is sound sensitive and something startles her. I massage her so that she is able to sleep without being awoken from muscle spasm. Such amazing dedication! It's truly wonderful to find someone who has the compassion and patience to care for a pet like this. Does she do things that "normal" cats like to do? Very much so! She loves to explore, climb, stalk, hide, play with all the regular cat toys like laser pointers, mice, and feather toys. 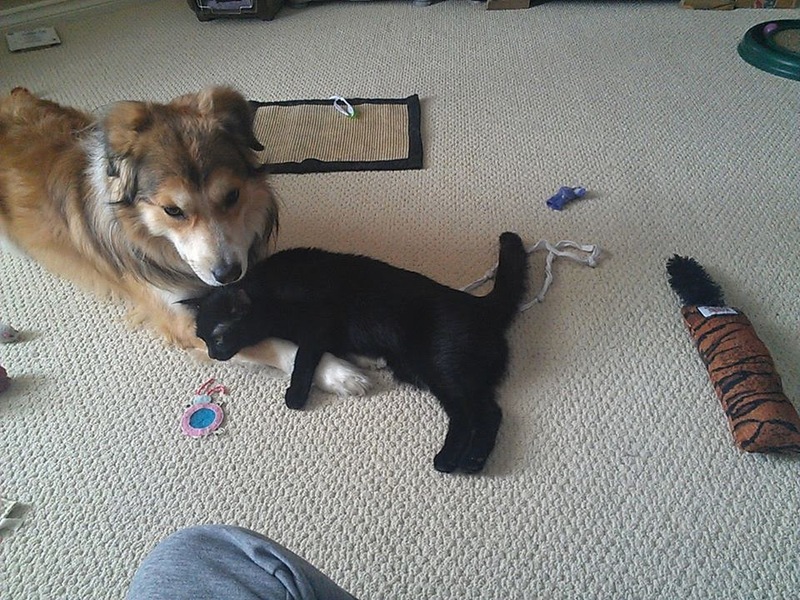 Merida loves chase, and tries to chase the senior cats. If she gets up and can run, she can REALLY run! Stopping, is another story. She can also jump quite high, but only straight up in the air, so jumping onto things she cannot do. However, she loves to jump! Looking outside is a love, just like any regular cat. Sounds just like a "regular" cat to me! Do you have any other pets? I have 3 other pets. A humane society senior cat of 15, who likes to clean and play with Merida as long as she doesn't play with kitten rules. Another senior cat, age 10, who was severely abused as a kitten on the streets. Her and Merida have no contact, she has a real cattitude and does not get along with new people or all other animals. She keeps to herself, or my lap. I also have a young dog, 1 1/2 yrs old, that loves to play with Merida and likes to babysit her. He will always let her chew on him and cuddle, but when I am not in the room and she is doing something she is not supposed to be, he will nudge her away from it, or come and get me. They are best friends really! Sounds like a wonderful group of pets. It's good to know that you have some extra help taking care of Merida from the other animals. Update: This post was originally published about a year ago in April of 2013. Merida is still going strong and is a happy and playful adult kitty now. You can follow her on Facebook and Twitter. She also has her own website here. Special thanks to Amber for letting me share her story and photos! 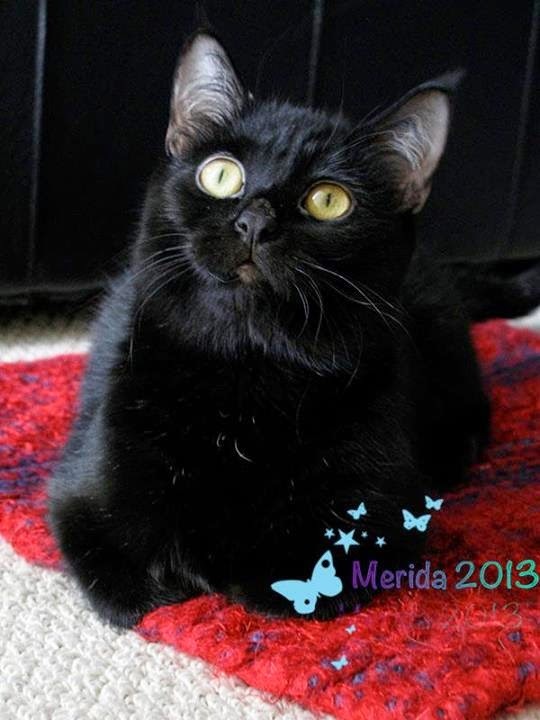 We are happy that Merida has a loving home and that all her needs are met. How kind of her mum to save her and look after her. Have a marvellous Monday. Oh Merida has such beautiful eyes.....I'm so happy she has a home with a human who understands her and her special needs - sounds like she has a real buddy with the doggy who watches out for her too! Glad to hear she's still doing well.....! She is a totally beautiful girl and I am so happy she has the love she deserves. What a sweet and beautiful girl! This is such a feel good story...so happy to know she is in such a loving forever home with a human who is so compassionate an dedicated to her needs. What a sweet little kitty and such a nice mom. Sounds like she is in the perfect place. Love, love, love this story. Thank you for sharing it with us! We are so very very happy Merida is doing well, a year later! YAY!